The Industrial Revolution did not just change life in the city; it also transformed life in the countryside during the 1800s. Whether celebrating or critiquing country life, the works on paper featured in this gallery by artists including Vincent van Gogh, Camille Pissarro, and Léon-Augustin Lhermitte, reveal how agricultural practices and consumer tastes were changed by new technologies, crops, and labor practices. The exhibition of works on paper in Gallery P28 changes every twelve months to showcase the variety of the collection and also to limit exposure of the light-sensitive pigments. Léon-Augustin Lhermitte, French (1844–1925). 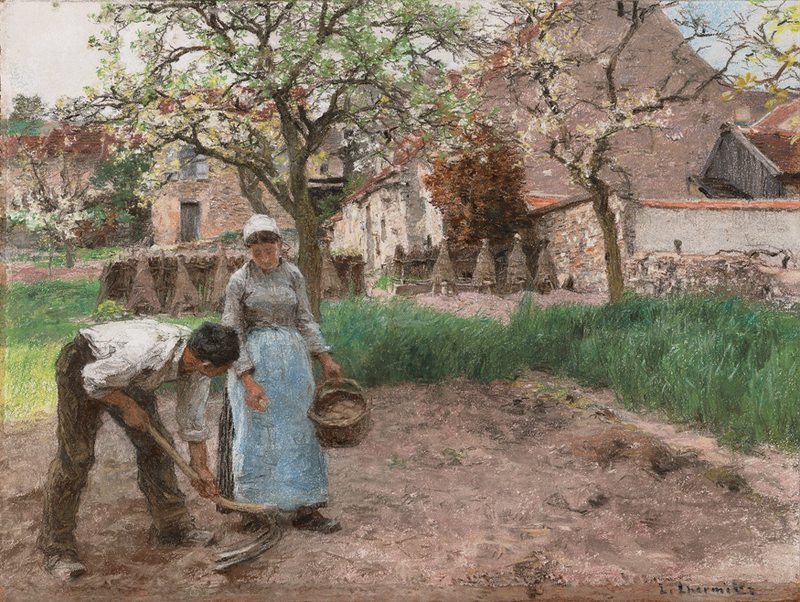 Potato Planting in Spring, 1888. Pastel and charcoal on paper, mounted on canvas, 16 7/8 × 22 3/8 inches. Gift of James W. Sight and Dr. Heidi Harman in honor of the 75th anni¬versary of The Nelson-Atkins Museum of Art, 2014.21.